What Will Happen To WOW Air’s New Airbus A330neo’s? After an airline collapses, one of the biggest questions is always in regards to the future of the airline’s fleet. In many cases, the aircraft will be returned to lessors or sold off to other airlines. For WOW Air, there is the conundrum of their brand new A330-900 that was never delivered. Whatever will happen to that plane? WOW Air leased their A330-900 from Avolon, a well-known aircraft leasing firm. Avolon’s total fleet numbers over 950 aircraft, all leased out across multiple carriers. Some well-known customers include China Eastern, WestJet, Ethiopian, Etihad, Qatar Airways, and many others. Avolon leases out both narrowbody and widebody aircraft. Now that WOW Air have collapsed, their A330-900 is without a home. With this A330-900, Avolon are in a good position to find an airline to lease it to. Since it’s brand new, all it will need is some new seating and a paint job. There could be plenty of demand for this plane. Let’s take a look at some of the potential operators of this A330-900. Azul is a Brazilian airline that wants to use A330neo aircraft to expand their network to Europe and North America. Currently, Azul has an agreement for the leasing of five A330-900 aircraft from Avolon. These A330neos are expected to enter service by the start of the summer season. Given that Azul is a client of Avolon’s, the lessor could negotiate with Azul for them to take an additional A330-900. For an airline growing as much as Azul is, this could be a major boost to their route network. TAP was the launch operator of the A330-900. They expect to have over 20 A330neo aircraft in service once deliveries are complete. For TAP, the A330neo will replace A330-300, A340-300, and some A330-200 aircraft. However, TAP Air Portugal could elect to add an additional A330-900 for expansion. In recent months, TAP has announced new flights to San Francisco, Washington D.C., and Chicago from their hub in Lisbon. An additional A330-900 could increase capacity on some routes while opening up options for more new destinations too. AirAsia’s long-haul subsidiary, AirAsia X, has 100 A330-900 aircraft on order. Avolon currently leases some aircraft out to AirAsia. With an additional A330-900, AirAsia could add some more destinations. Granted, one new aircraft on a 100 aircraft order does not add much in terms of capacity, but it could open up new route pairs or help AirAsia increase frequencies to meet connections. Furthermore, this A330-900 would be available for AirAsia well before most of their A330-900s on order would be delivered. This could allow AirAsia to expand their network sooner rather than later. Most importantly, AirAsia X could start flying to Europe with A330-900 aircraft quicker than planned. Garuda Indonesia and Delta Air Lines are also customers of Avolon. Both are Skyteam members and full-service carriers. While Garuda is a bit more colorful in earning customers, both airlines are cautious when it comes to expansion. 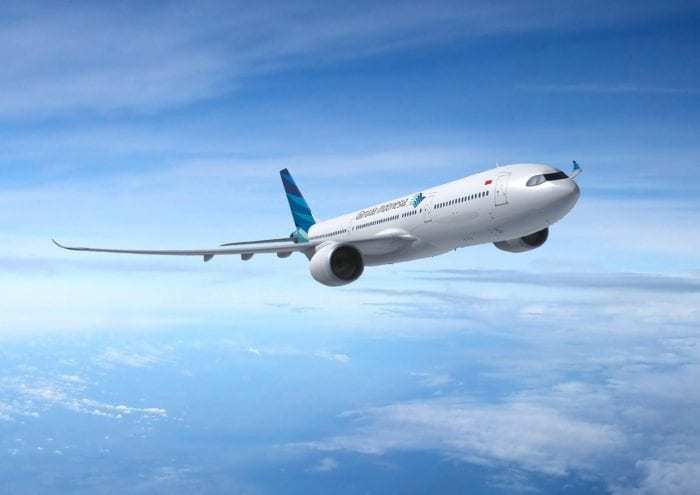 Garuda Indonesia has 14 A330-900 aircraft on order while Delta Air Lines has 35. For either, an additional A330-900 could be used to expand capacity, or retire older aircraft like Delta’s aging 767 fleet. The reason we indicate these as wild cards are because they are highly unlikely to take on an additional A330-900. Both airlines prefer to order in bulk since it allows them to work out discounts. However, since Avolon will probably want to get this A330-900 out to a customer soon, it opens up the possibility for either Delta or Garuda to take on an additional aircraft at a bargain price. It will be interesting to see where this A330-900 ends up. We’ll be on the lookout for any airline taking an additional A330-900 and report it here at Simple Flying. Avolon declined to comment at this stage. Do you have any guesses where this A330-900 could end up? Where would you like to see this A330-900 flying? Let us know in the comments below! Personnellement je le verrai bien soit chez air Senegal, XL AIRWAYS, Corsair international airlines, Air calin ou Emirates. Ce n’est pas impossible en effet. Il y a beaucoup de compagnies qui ont un potentiel pour acheter ces appareils. Il faut considérer je pense tous les opérateurs d’A330. Par exemple, Swiss a 1 B777-300 en commande, et Swiss opère aujourd’hui 5 A340. Elle pourrait remplacer les A340 restants par l’A330 si les prix le permettent. Le choix pour le B777 était déjà une question de prix, et dans ce cas, les opportunités seront intéressantes je pense! De plus, ça pourrait être une manière pour Lufthansa d’évaluer cet appareil. Parmi les autres clients potentiels, il y a aussi les “petites compagnies”. Celle qui ont des avions plutôt anciens et qui pensaient se diriger vers le marché de l’occasion et qui pourraient voir une opportunité avec cet appareil. Certaines compagnies ayant une petite flotte pourraient même considérer de ne pas trop modifier l’intérieur. Si la stratégie d’une de ces compagnies correspond au standing et à la stratégie en terme de passagers, l’A330-900 sera clairement compétitif. Donc tous les opérateurs d’anciens B767 sont des clients potentiels. Tous les opérateurs d’A330, MD11, sont aussi des clients potentiels. Et évidemment, il y a toutes les compagnies qui veulent se lancer sur le long courrier à bas coût. L’A330-900 devrait être l’appareil le moins cher à opérer. Donc il y a aussi un grand marché. Le gros avantage d’Airbus c’est d’avoir un appareil qui n’attend que d’être livré, et ça peut intéresser bien des clients. Et les nations peuvent en faire partie. Je ne serais pas étonné de voir Airbus offrir les 4 A330-900 à l’Allemagne en lieu et place des 3 A350-900 et pour un prix similaire par exemple. Et les compagnies de leasing et de Wet Lease seront probablement prêtes à sauter sur l’occasion. Le Business Model de Hi Fly est intéressant, je pense qu’il y a un certain potentiel en Wet-Lease. Et l’A330-900 est un bel appareil pour ce rôle ! This article only focusses on only one (never flown) aircraft. What about all the other aircraft in the former WOW-air fleet?